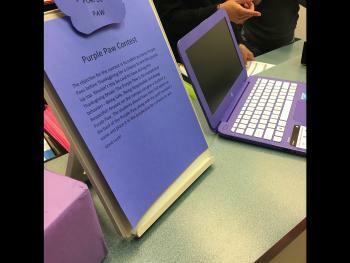 For the month of November, staff at Hempstead Elementary will be looking for students who exhibit exceptional behavior and give them a Purple Paw to turn into the purple box for a chance to win a purple HP laptop donated by Hempstead Elementary PTO. The Purple Paw is for exceptional behaviors – Being Safe, Being Responsible, and Being Respectful! Anyone on the campus can give a student a Purple Paw. The students should have their full name on the back of the Purple Paw along with the staff member’s name and place it in the purple box for a chance to win.